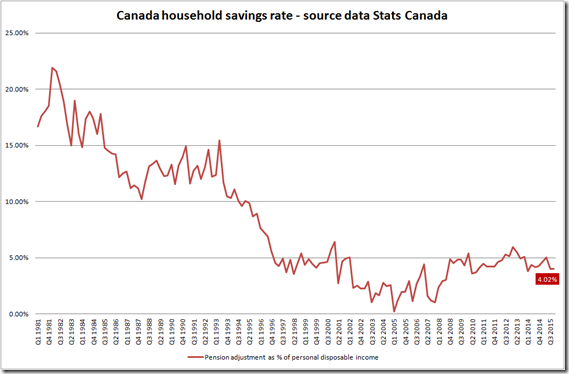 Canada: some niggles in savings rate data.. 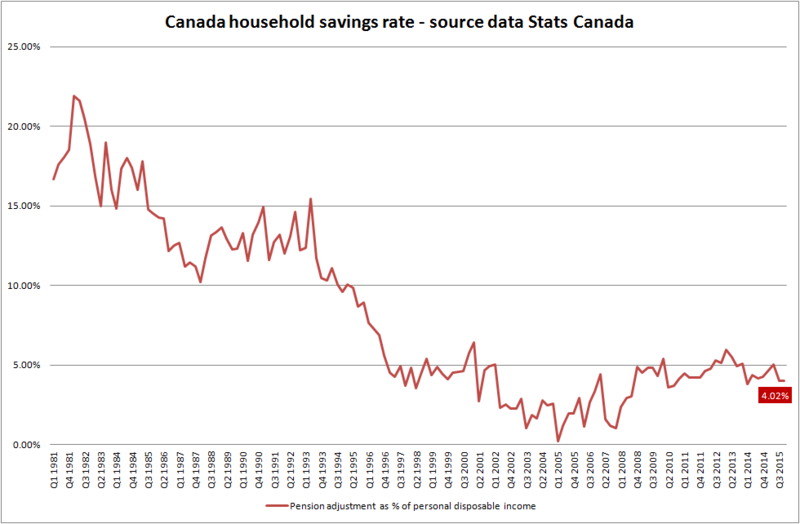 But the data hides a starker reality: disposable income less household expenditure in Q4 2015 left a savings rate of 0.5%. 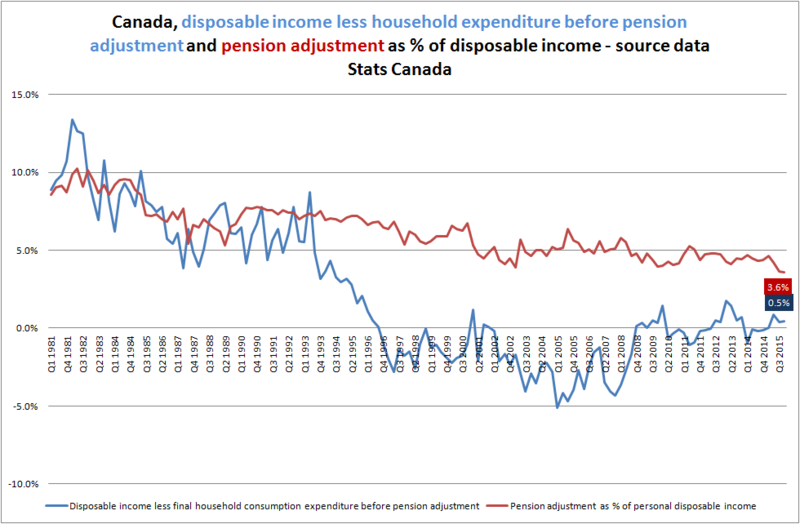 The 4% savings rate is actually made up for the most part of a pension adjustment, a factor which has held relatively stable. 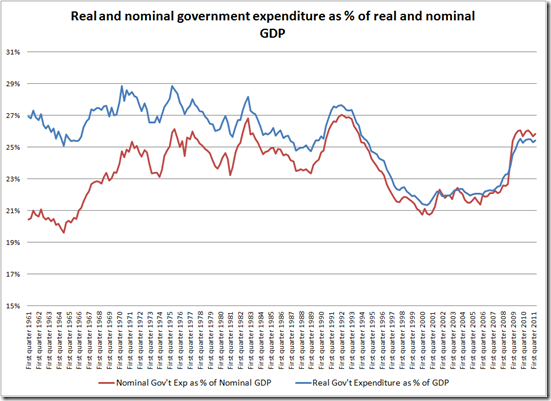 Not much room here for increasing expenditure. 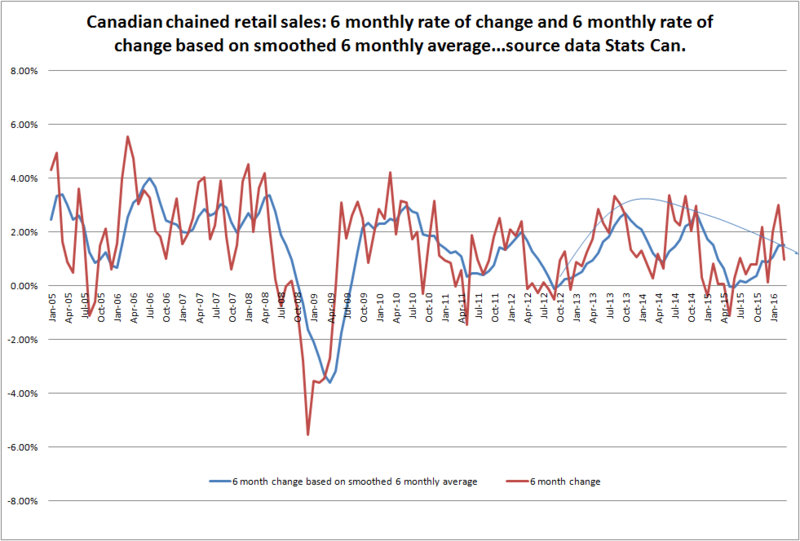 Retail sales fell 1% in cash terms in March on February and by 1.3% in volume terms. 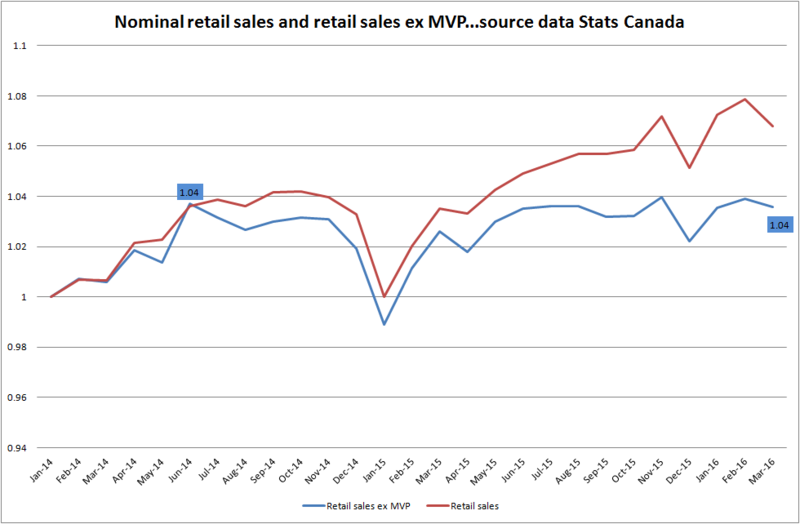 Over the year volume (real) retail sales grew 1.77% and by cash (nominal) 3.17%. 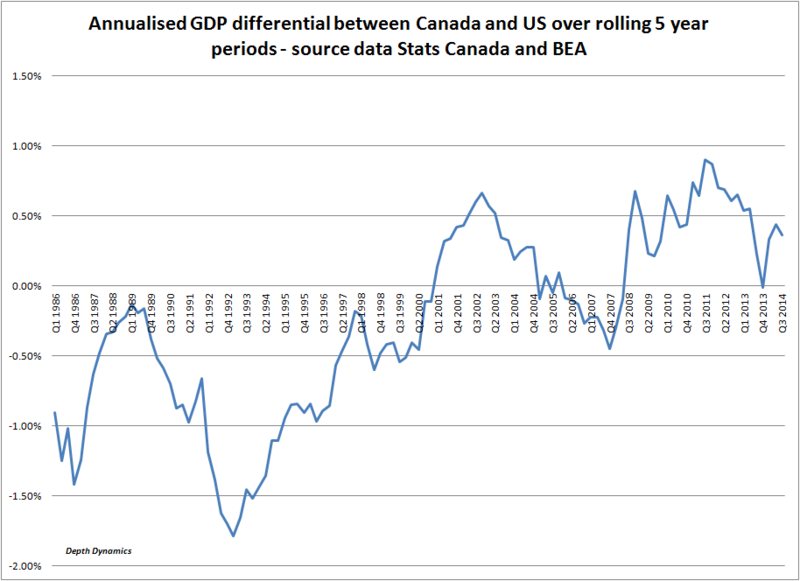 We can see this disparity below: the largest since the early 1990s, itself a rebound from the recently ended recession, so the current strength is significant. 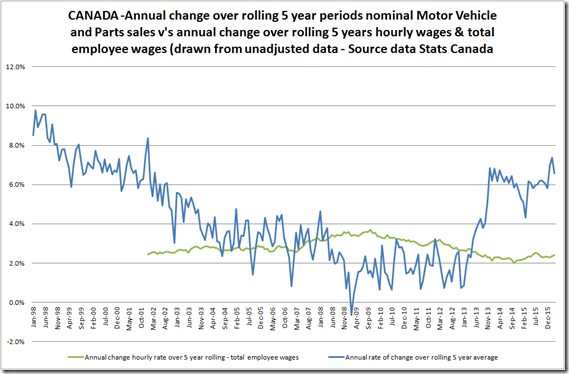 Durable goods consumption expenditure rose at an annualised pace of 9.4% (autos?) 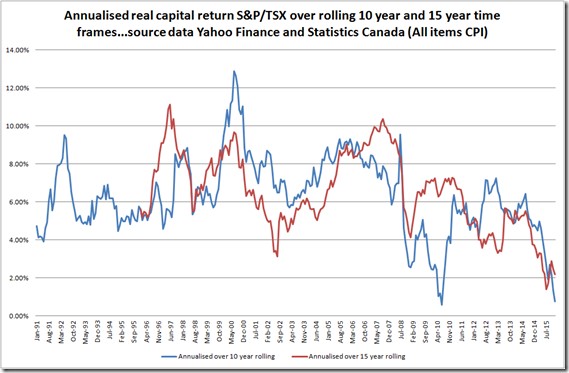 in the third quarter; business gross fixed capital formation (Commodities?) 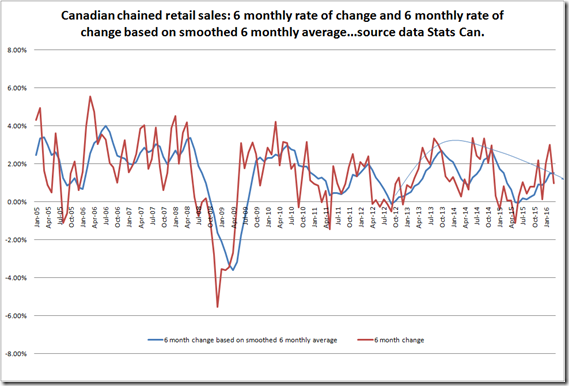 has fallen for three quarters in a row following a weak Q4 in 2014; inventory accumulation slowed dramatically (? 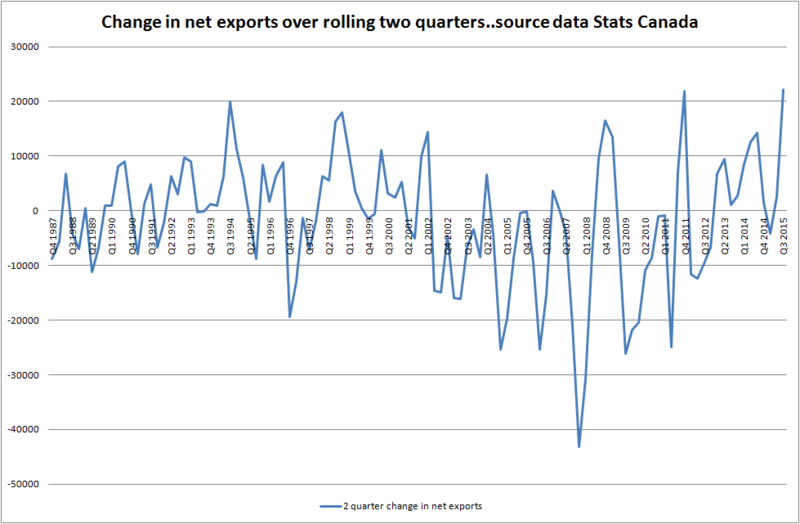 ); imports of goods and services fell for the second straight quarter running off the back of two weak quarters in Q4 2014 and Q1 2015. 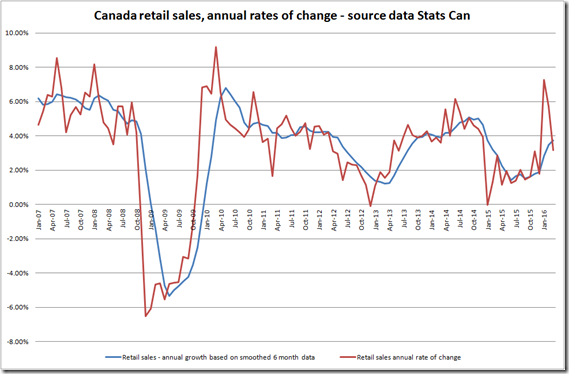 Looking at new Canadian retail sales data one would be forgiven for thinking that all is well on the retail front: yes we had a downward blip, but we have stabilised and things seem mildly resurgent in the year to August. 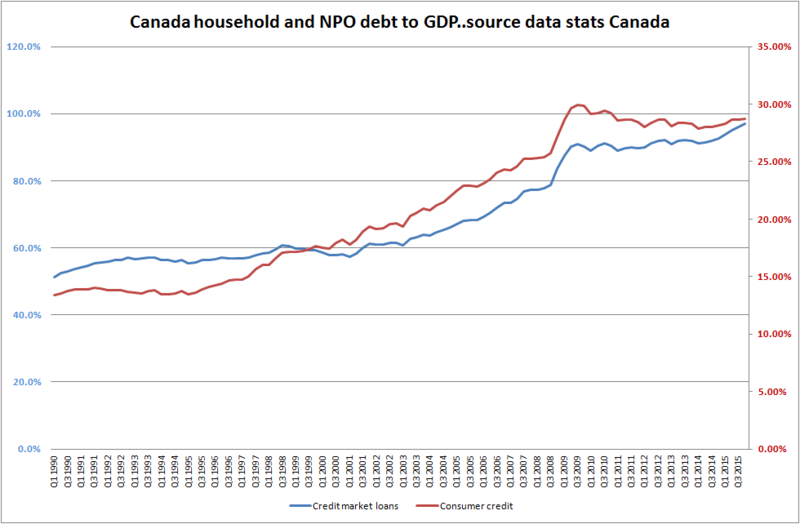 And recent independent commentary has also pointed out the large increase in auto related debt: When will Canada’s subprime car loan bubble burst? 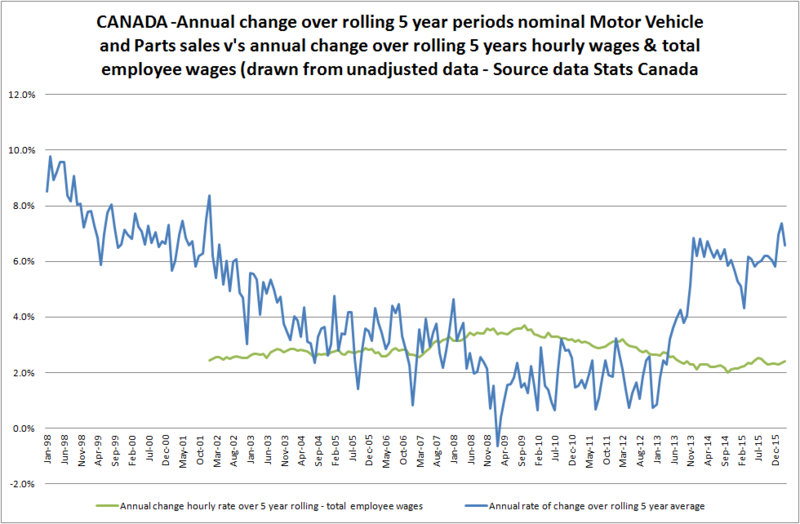 As we can see, auto related spending has taken a manifold hyper leap relative to the rate of change of employee wage growth. 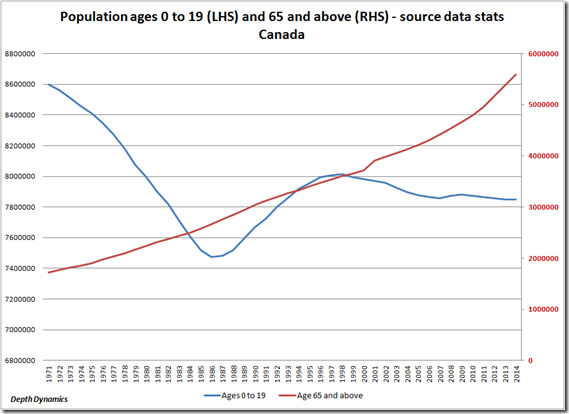 This is all deeply disturbing. 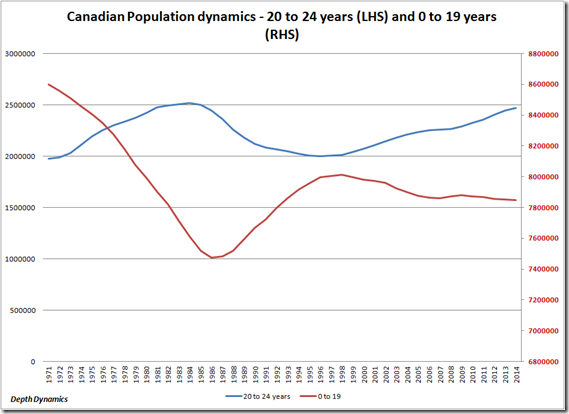 Is Canada’s Mini Golden Age behind it? 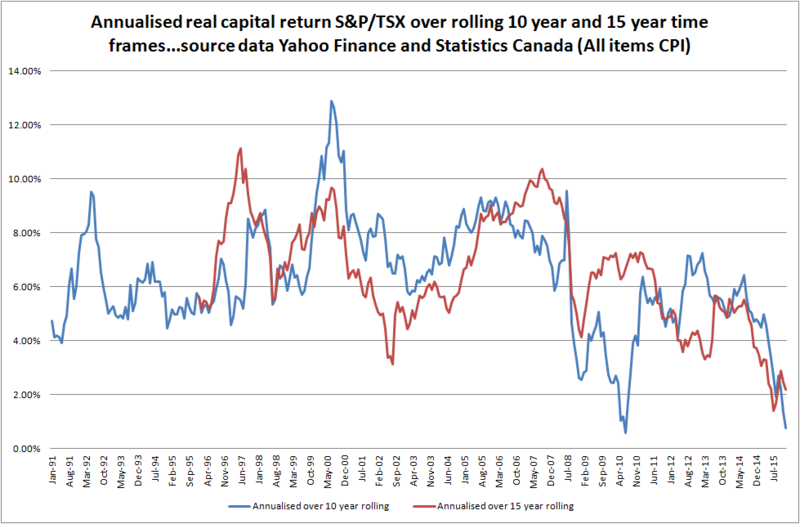 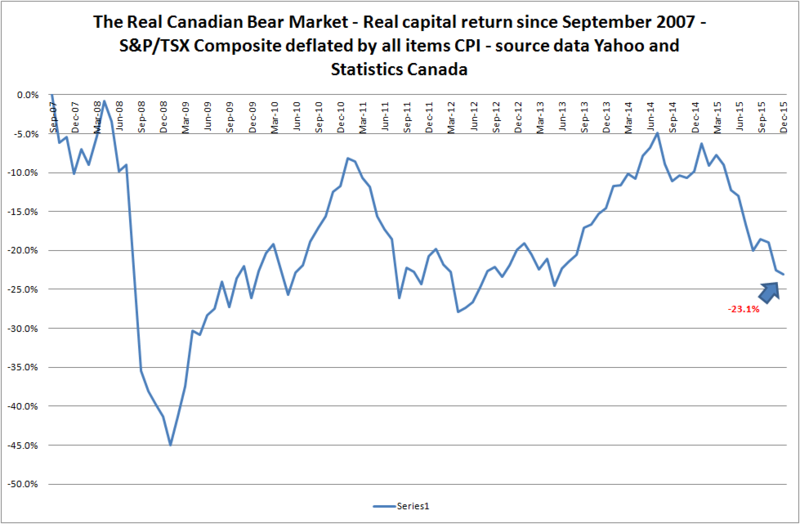 I remember back in the 1990s looking at long term Canadian stock market performance and thinking how lacklustre it had been. 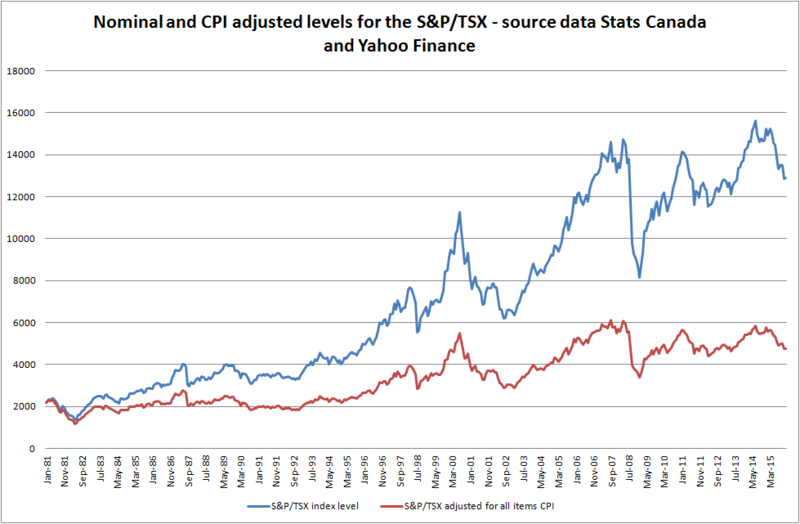 Since then of course things changed: while many markets have fallen back below levels reached in the 1990s (UK, France, Japan, Italy) Canada’s stock market, up until recently, has been ratcheting up one peak after another; its markets have behaved more like developing Asian markets (South Korea, Hong Kong etc). 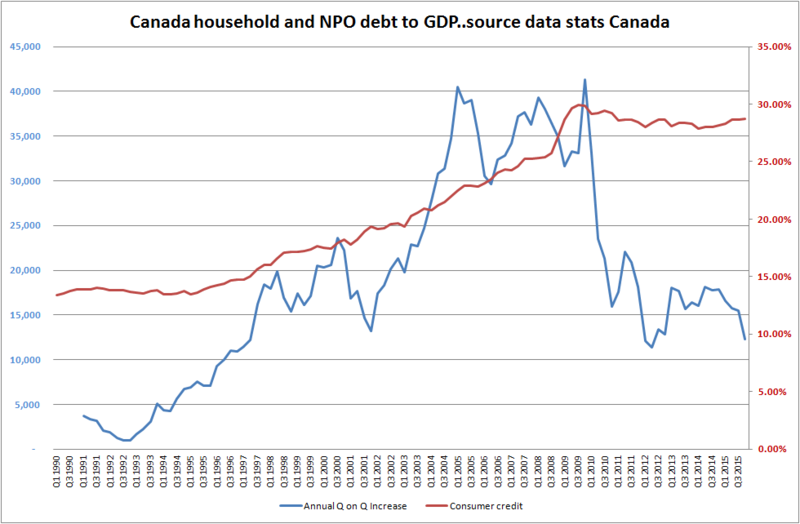 Commodity price and production increases have played a large part in much of post 1990s economic performance as has a considerable debt financed house price/construction boom and other debt financed consumer expenditure. 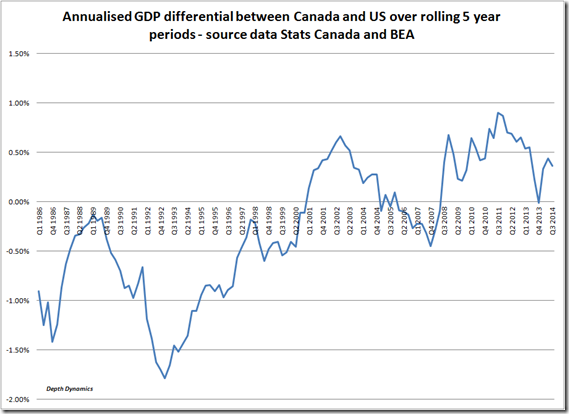 With the recent hefty collapse in oil (other commodity prices have been falling for a while too) it is worth asking whether Canada’s mini golden age has passed. 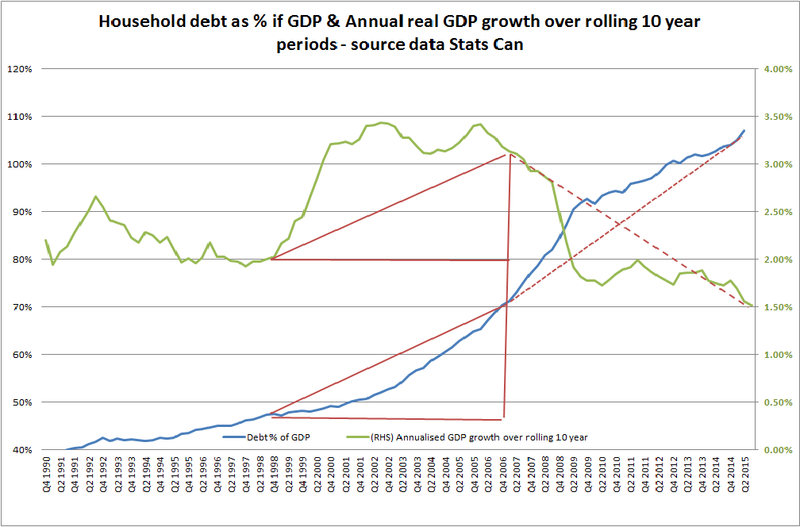 Certainly the boost that came from a debt financed property market boom is unlikely to be repeated and the consequences of debt more likely than not to weigh on future economic growth. 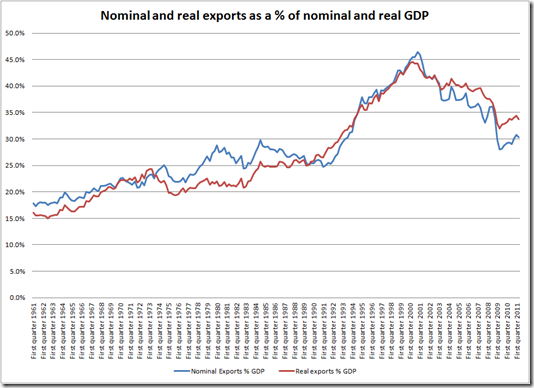 Additionally, China, a key figure in the growth of world trade and demand for commodities post 1990s is slowing down. 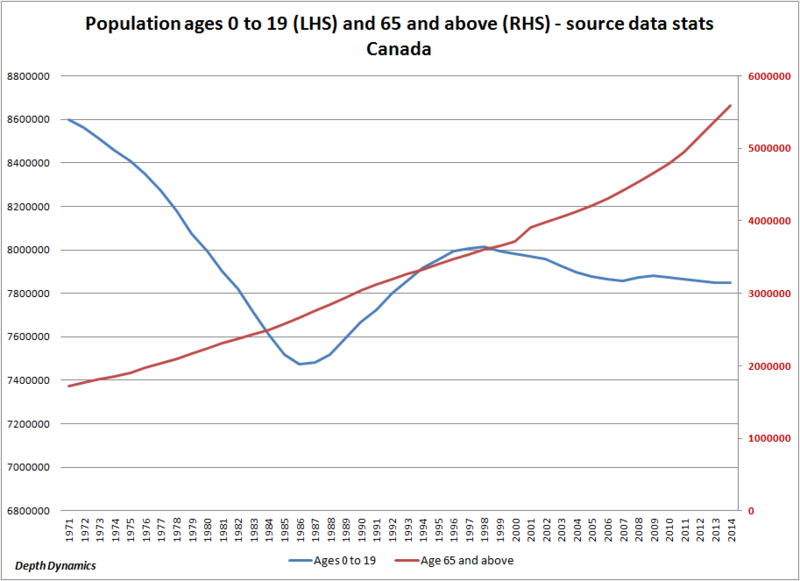 The age 65 and over population is expanding rapidly at the same time as under 20s has actually been falling. 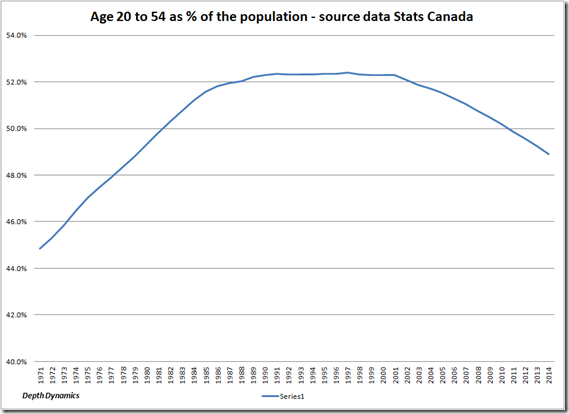 Back in 1990 12.5% of the US population was over 65 and 28.8% was 19 and below. In Canada the respective figures were just under 11% and 27.7%. 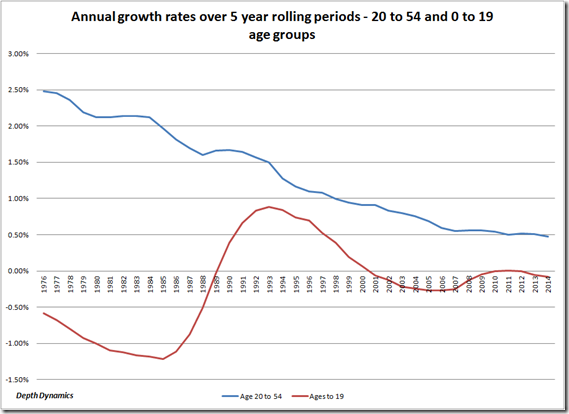 By 2013 US over the age of 65 had risen to 14.14% and those under 20 had only fallen to 26%. 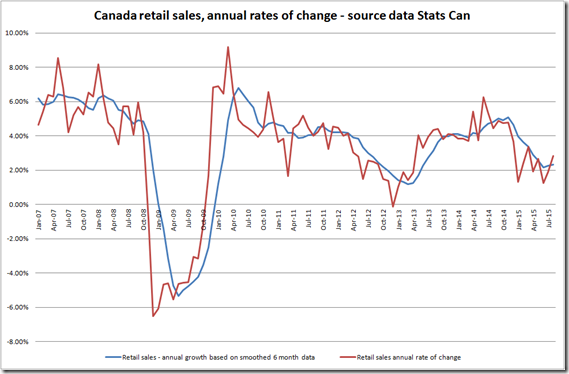 In Canada the respective figures were 15.3% and 22.3%. 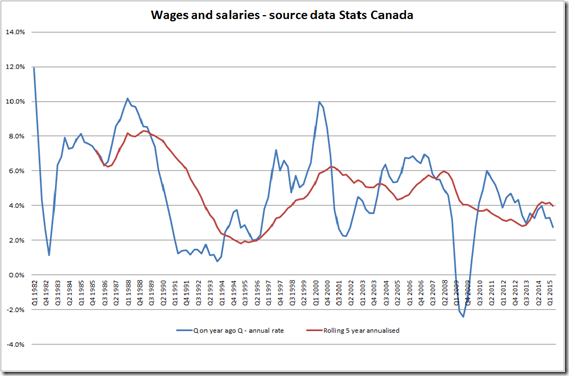 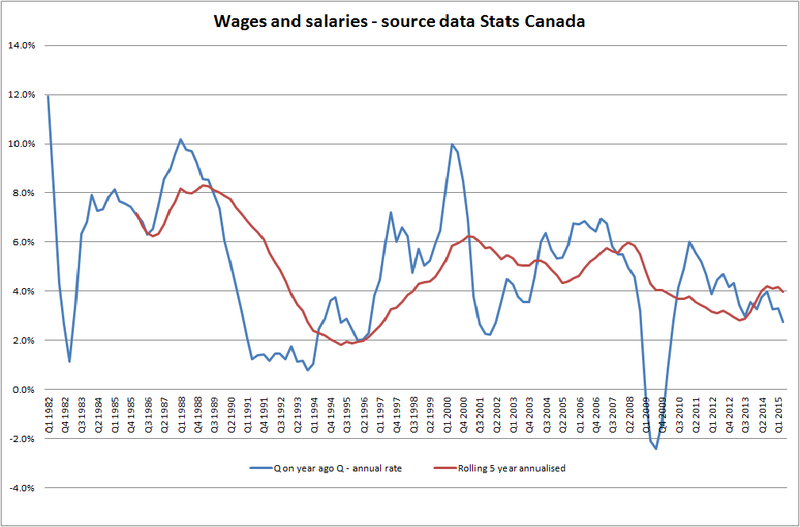 The trend is divergent: the working age cohort in Canada started at a higher level and has now shrunk to a lower level and looks set to fall further. 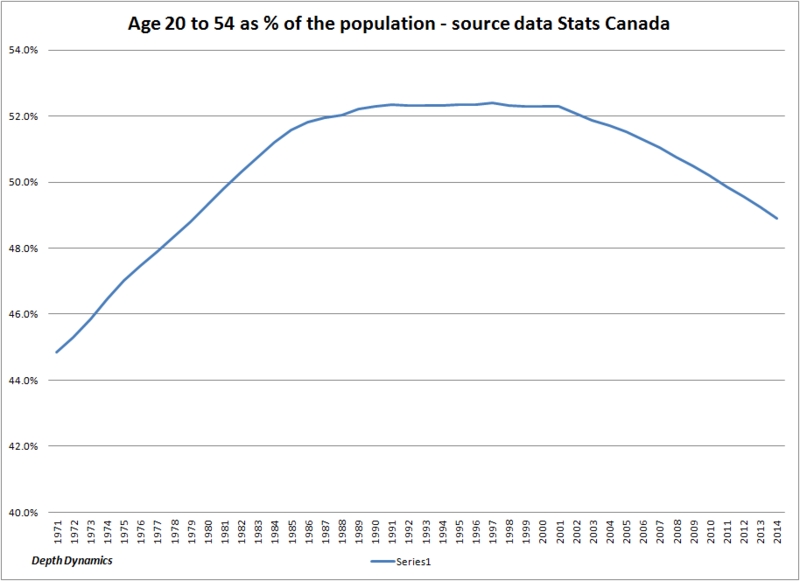 We can see the growth rate of the key 20 to 54 age group has been declining steadily. 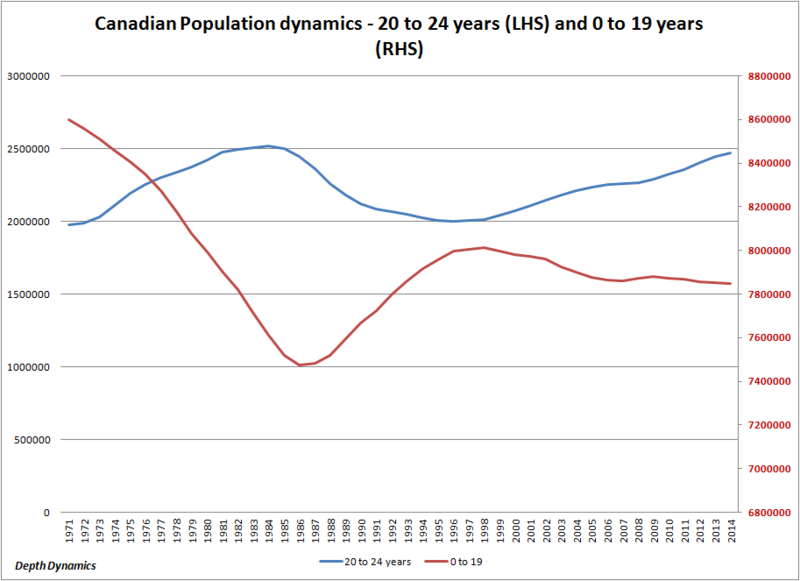 We also note that employment growth in the 20 to 24 age group (and hence the 20 to 54) had benefited some from a recovery in growth (long since past) in the 0 to 19 age group from the mid 1980s to the late 1990s. 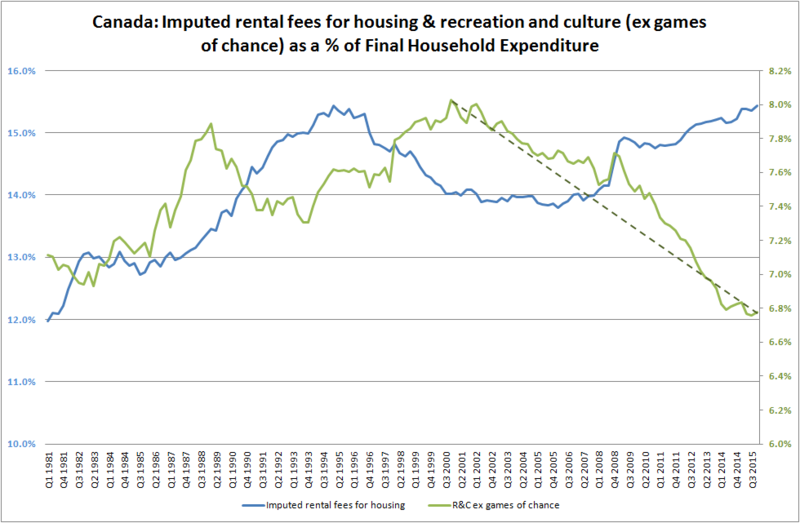 This has now worked its way out of the system. 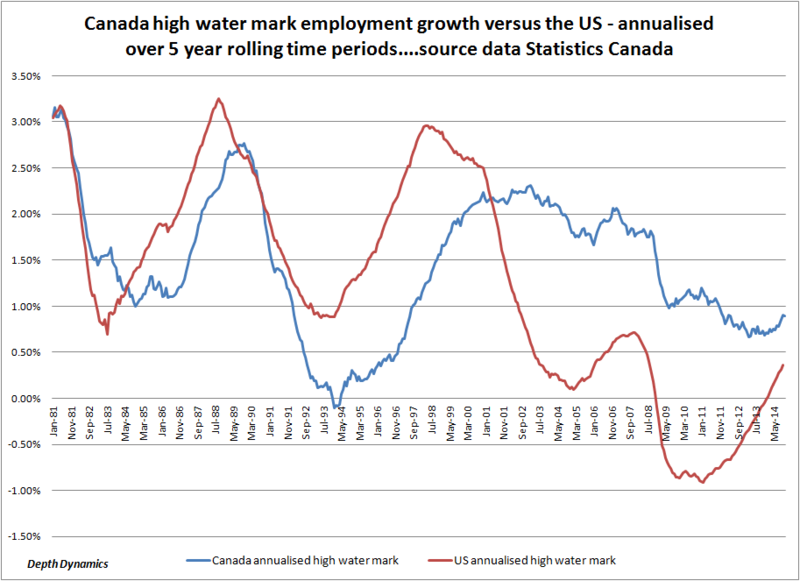 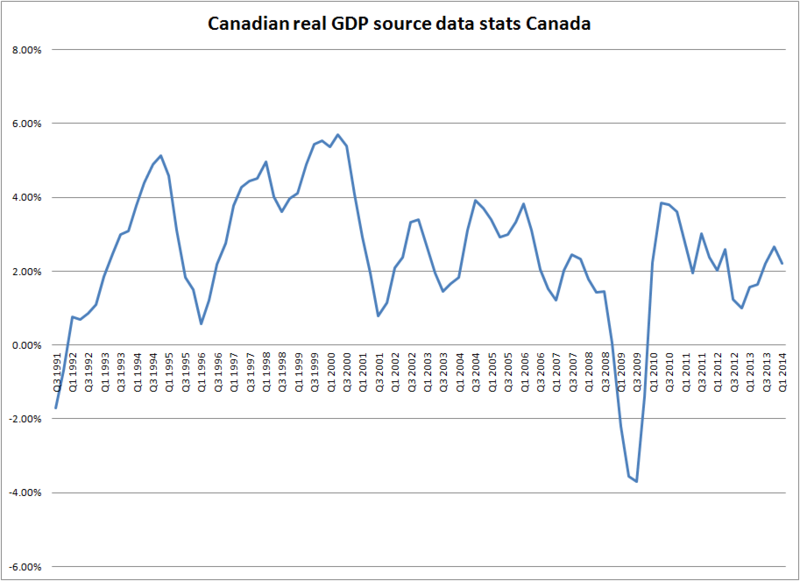 Canada has seen relatively strong employment growth from the late 1990s to around 2008, which had held up reasonably well post 2008. 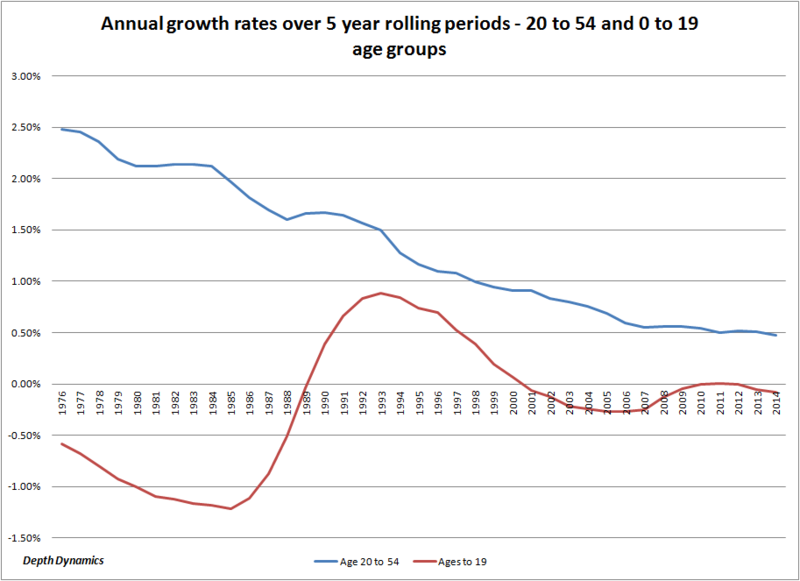 But if we assume that the 0 to 19 age group is declining and that the surge in employment growth has been due to a temporary surge in growth in the younger cohorts, expect employment and economic growth to suffer. 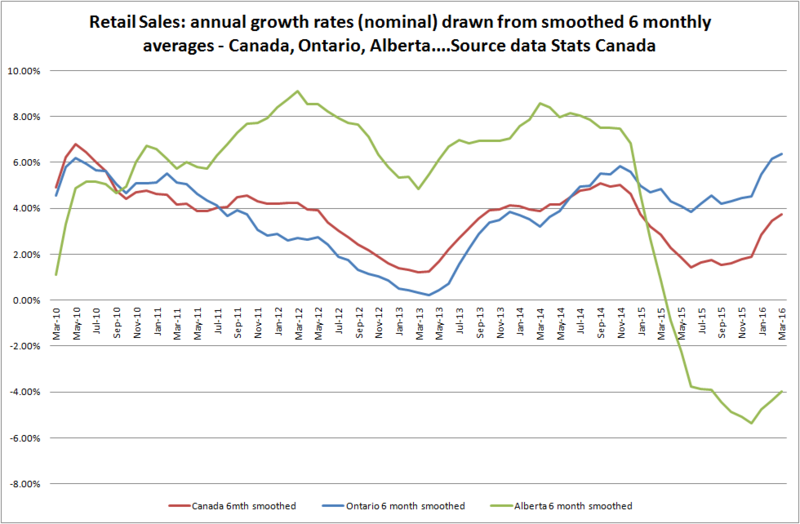 Also expect demand for highly priced properties to abate. 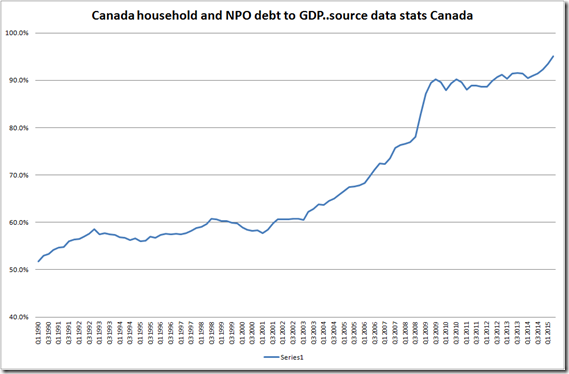 Poor demographics and high levels of debt combined are highly deflationary. 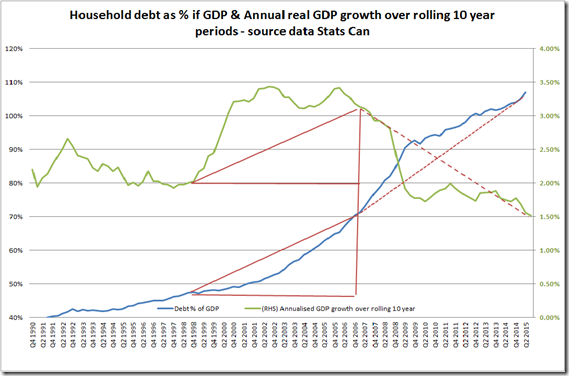 Moreover high levels of debt and slow economic growth risk further weakening population growth, compounding growth and debt problems. 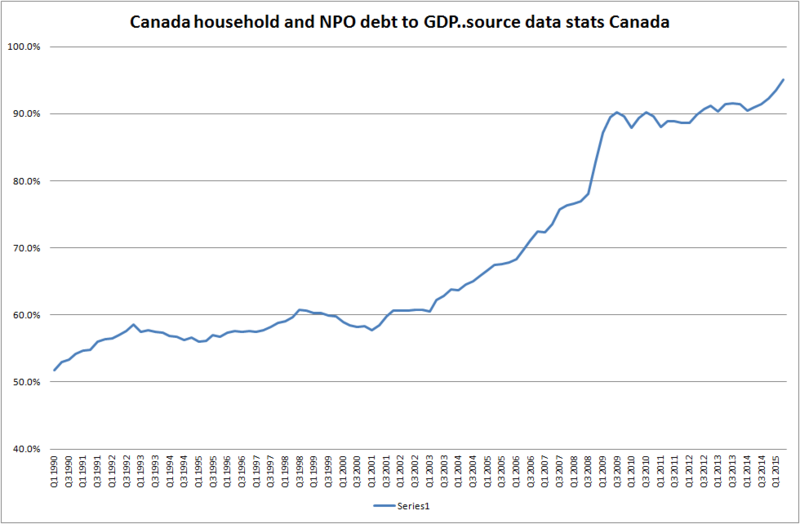 This to my mind is a key reason why we need to worry a lot more about debt levels. 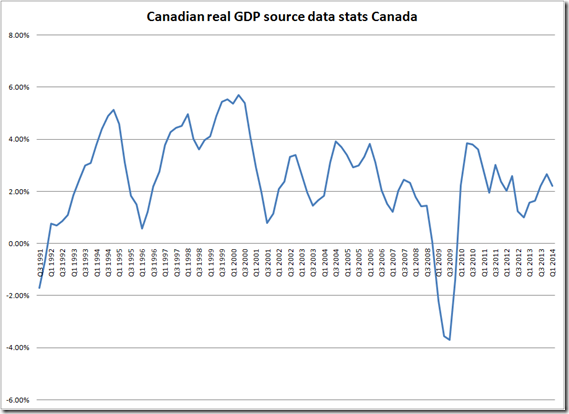 Canada’s GDP trend looks odd! 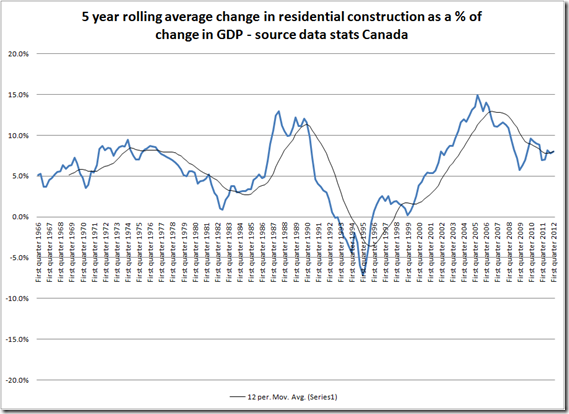 How important is construction to Canada’s economy…? 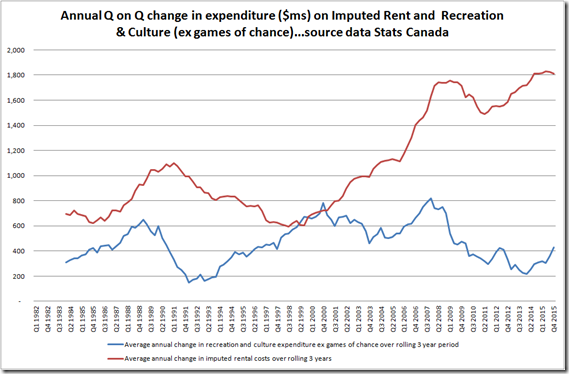 Thoughts on the Toronto Condo market: crash or soft landing..? 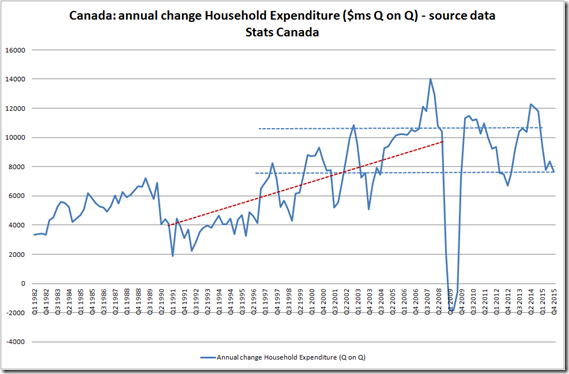 The first comment, of course, is a throw away line and means nothing. 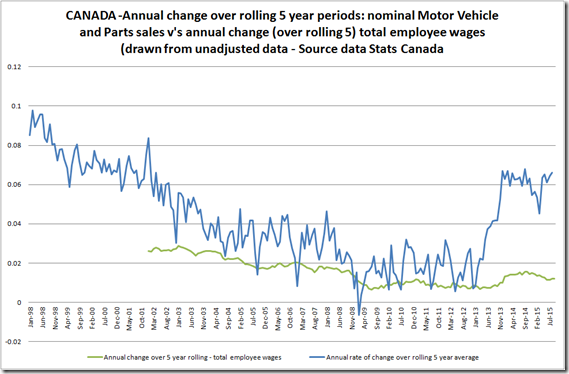 The second is arguably incorrect and ignores some key dynamics that could well lay the ground work for a crash. 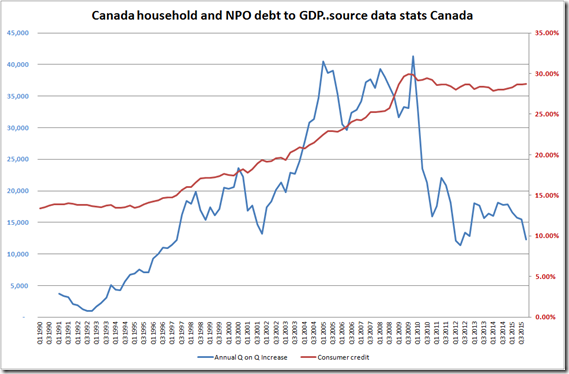 Canada is exposed to a weak consumer (high consumer debt), a weakening residential construction sector (and attendant financial sector risks), fiscal constraints and a dependency on weakening global growth. 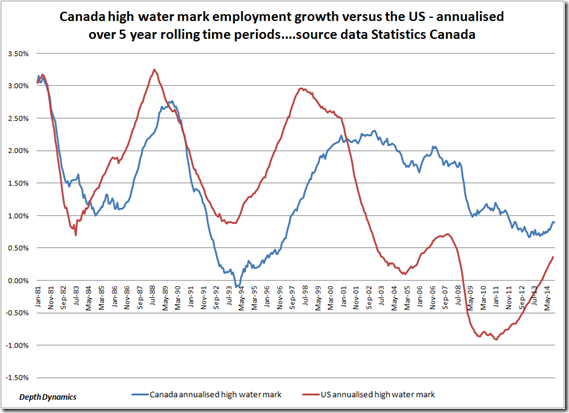 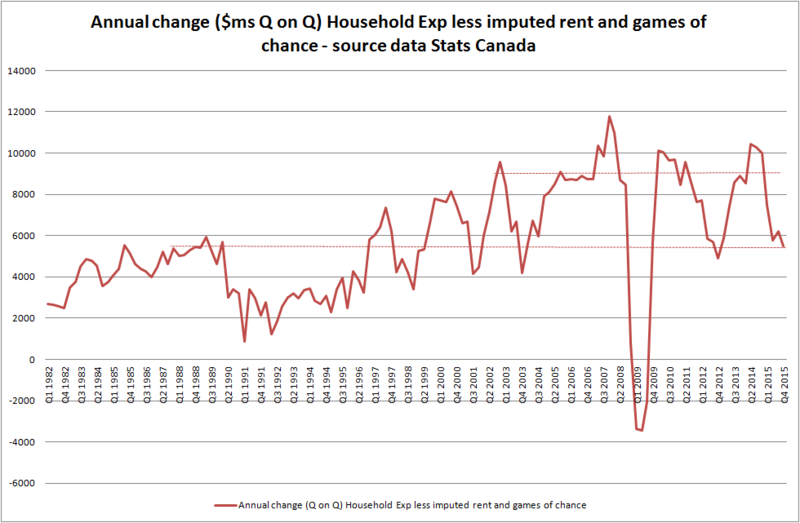 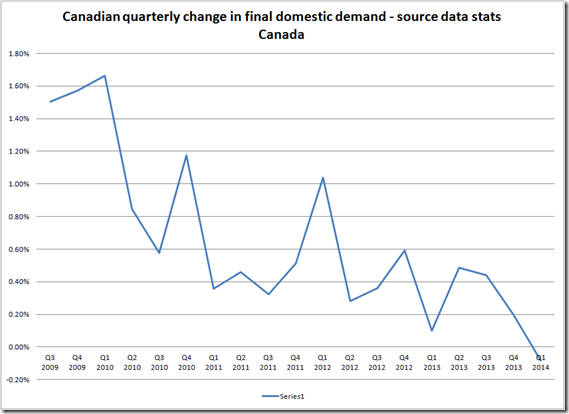 Canada’s housing market–off the chart! 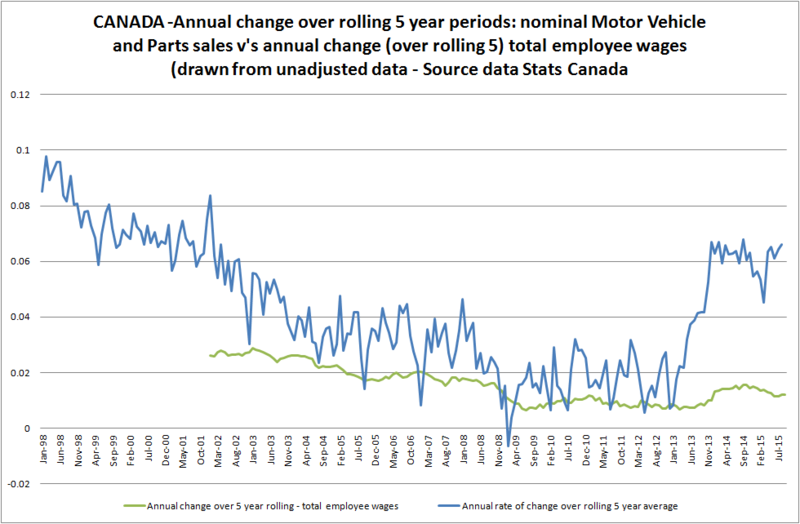 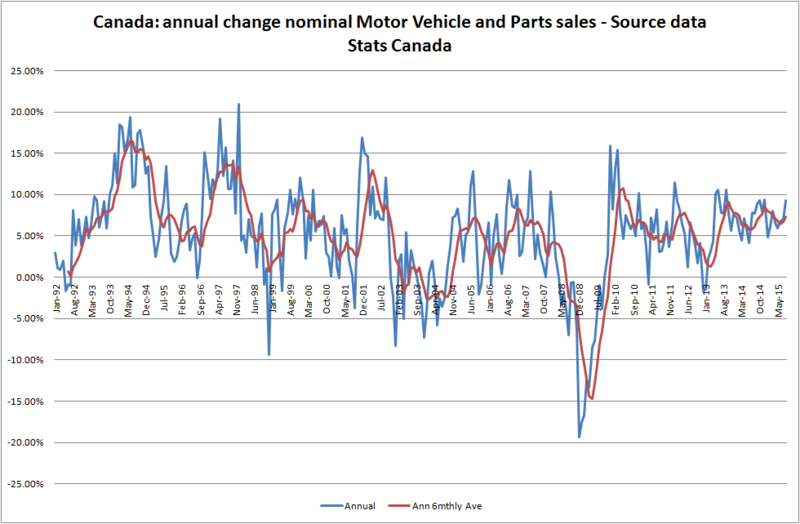 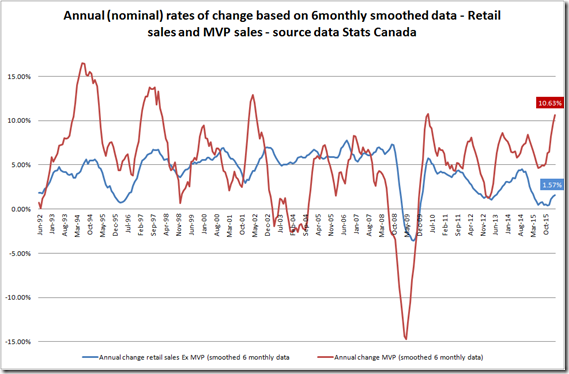 Canadian manufacturing sales have fallen for 4 out of the last five months having peaked in May. 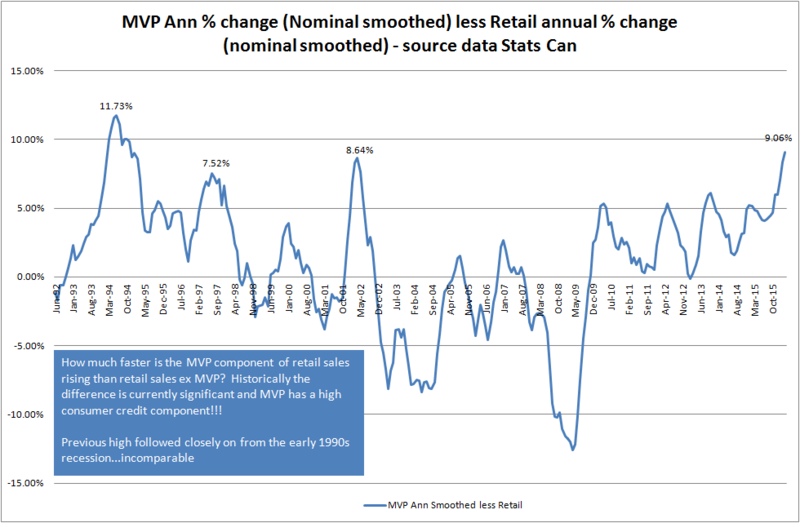 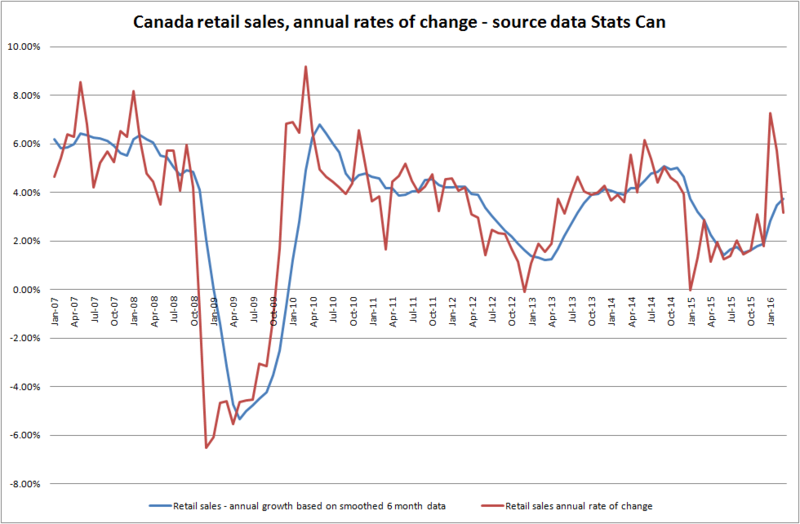 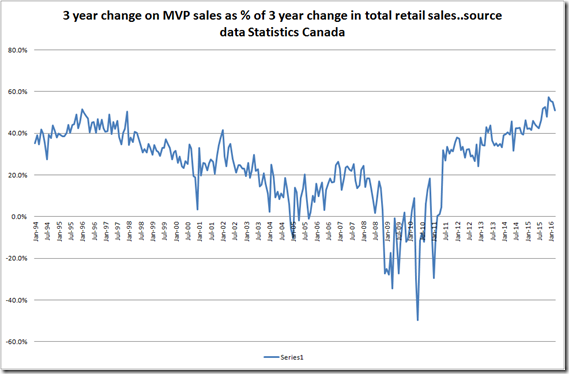 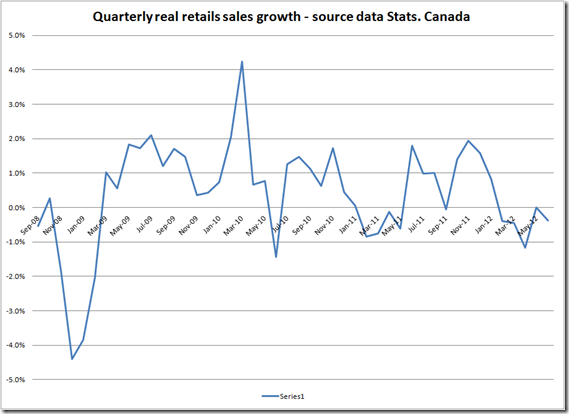 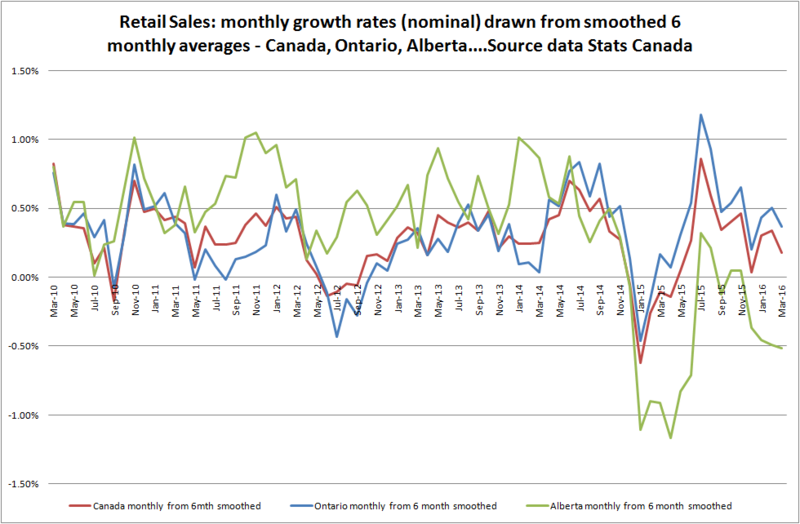 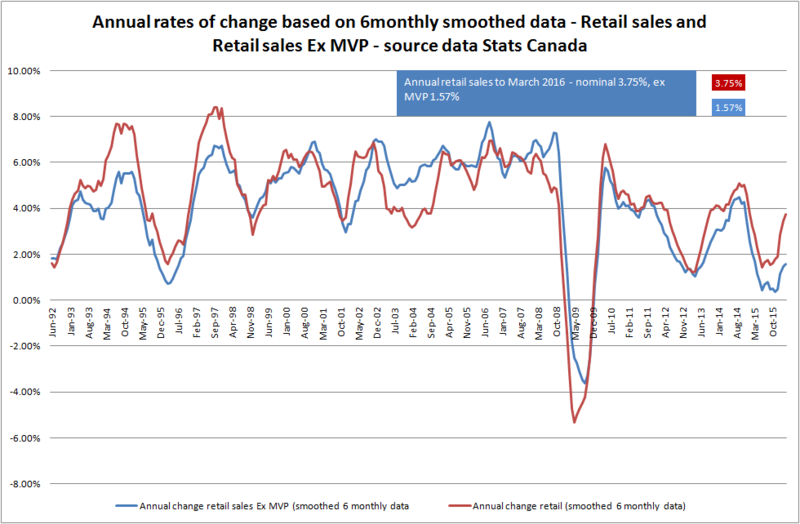 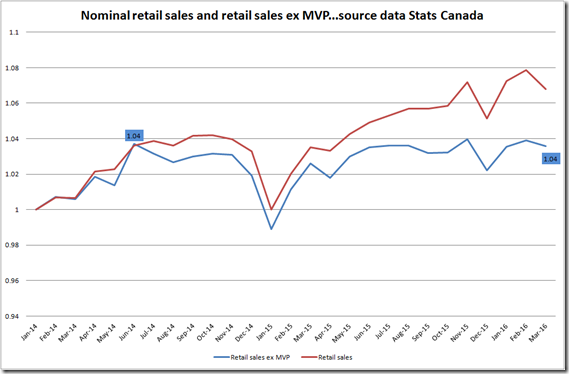 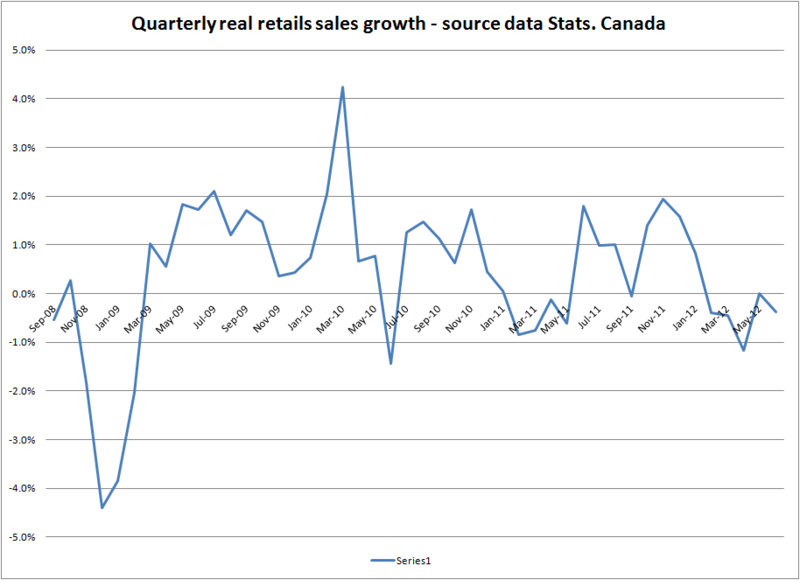 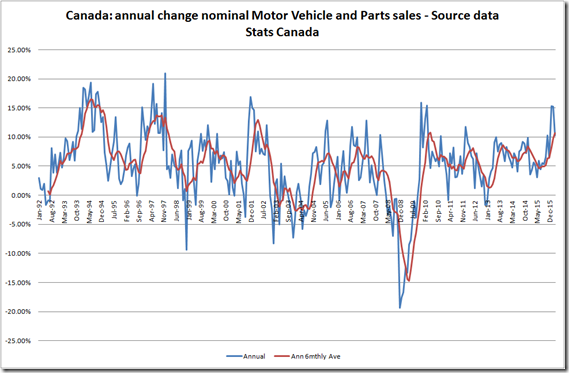 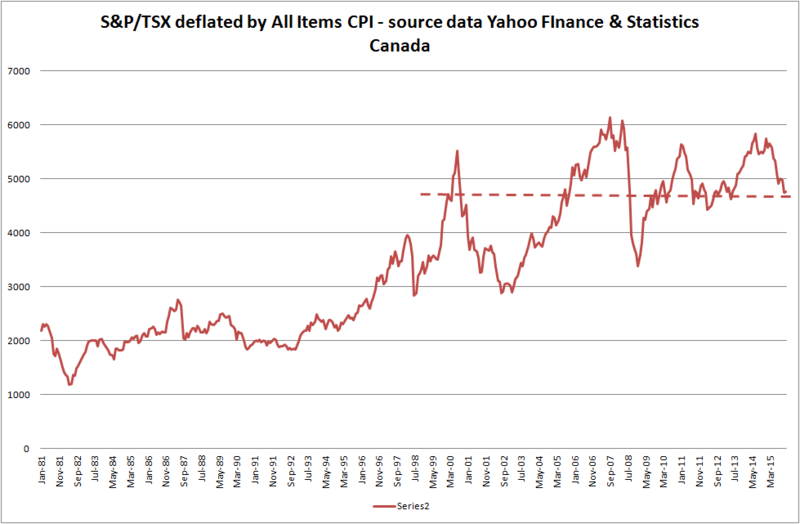 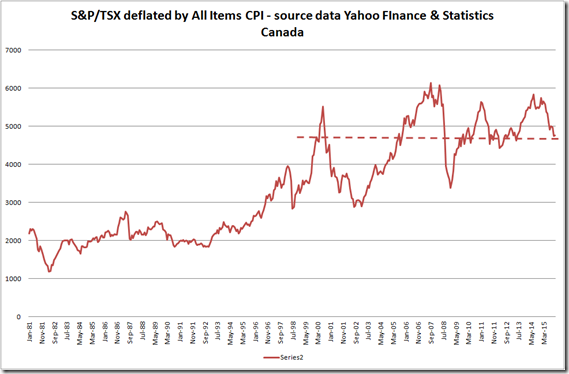 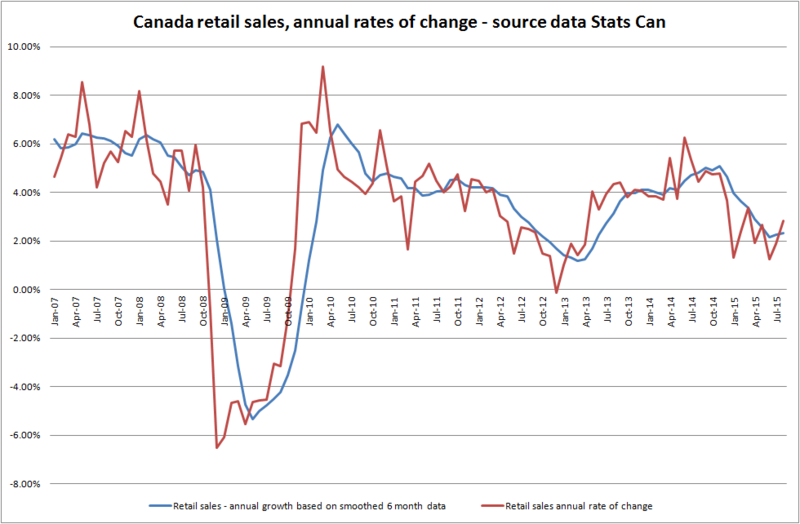 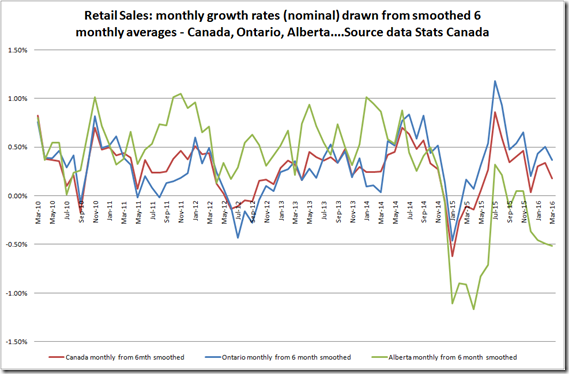 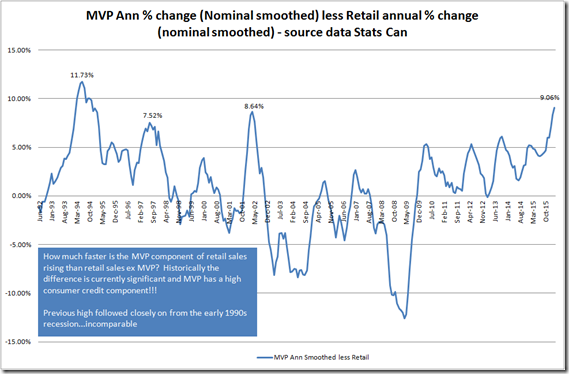 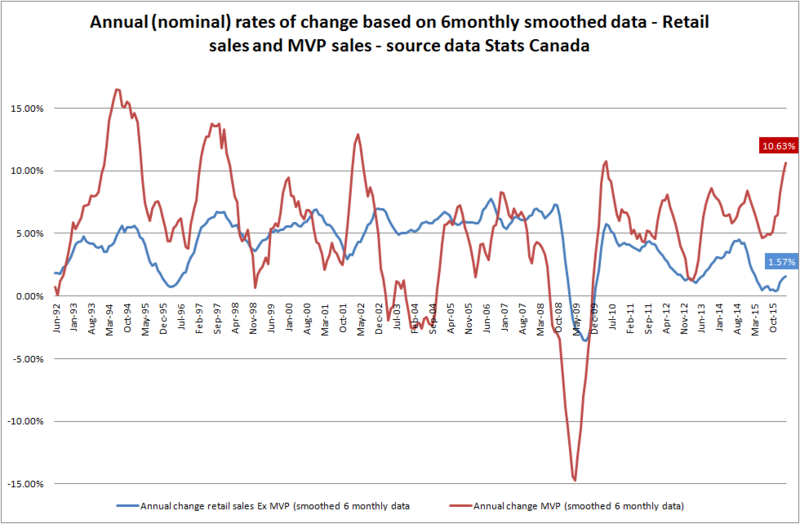 Retail sales: Ontario and Toronto, the fly in the ointment! Canada’s retail sales jumped 0.7% month on month, but most of the gains were concentrated outside of Canada’s largest province: Ontario retail sales grew 0.06% and have fallen since March by 1.16%. 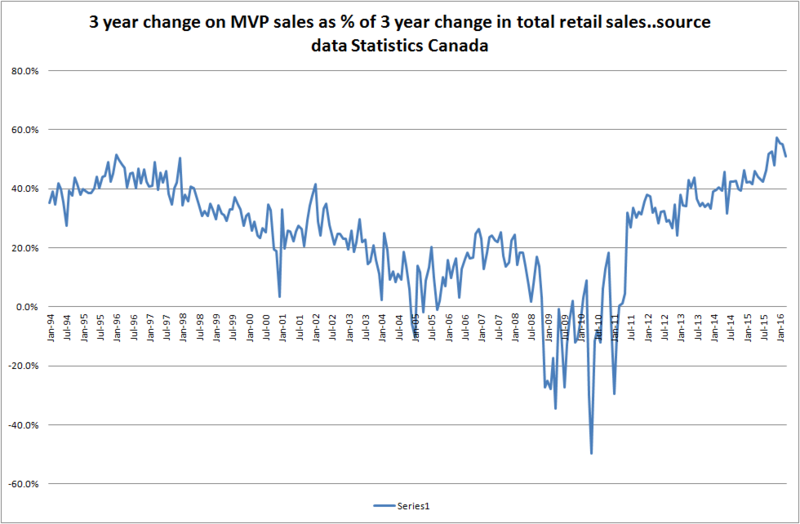 Retail sales data adjusted for the fact that there were 5 weekends in July 2011 and only 4 in 2012: actual year on year unadjusted data showed much weaker growth. 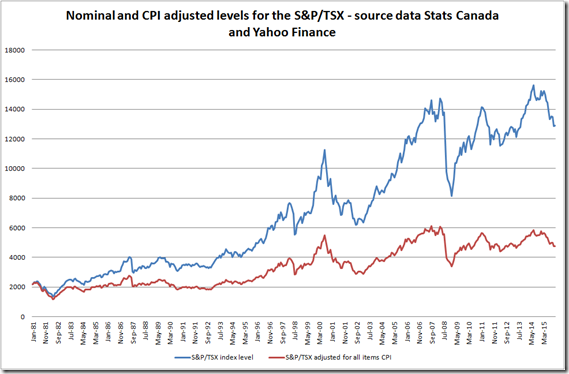 All data is sourced from Stat’s Can. 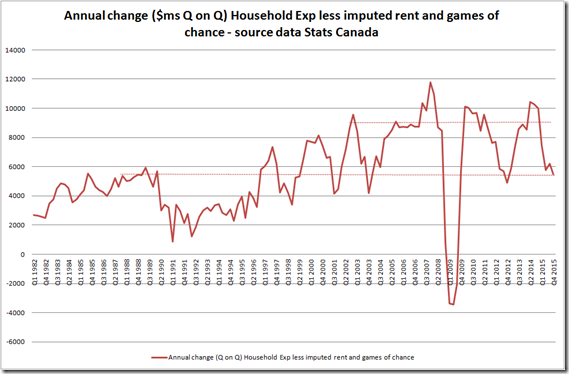 Beneath the surface of Ontario’s economy: what support for the housing market? 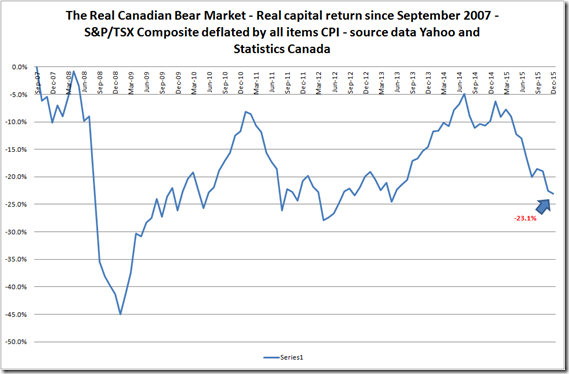 There has been a rising chorus of commentary on the Canadian housing market bubble of late and a number of recent articles (1, 2, 3) have infused the debate with comments from Robert Shiller of Yale. 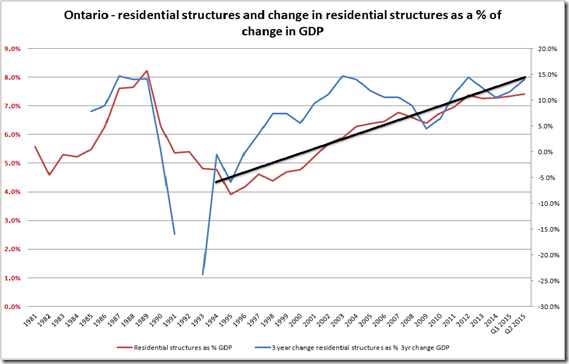 Shiller is one of the very few academic economists who does not appear to be caught by the Ivory Tower syndrome of efficient markets and rationale individuals. 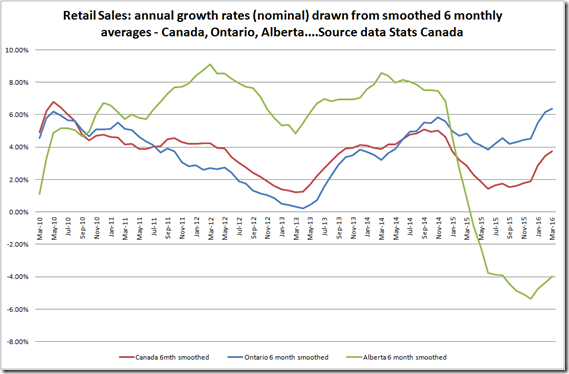 Concerns about flipping may be overblown! 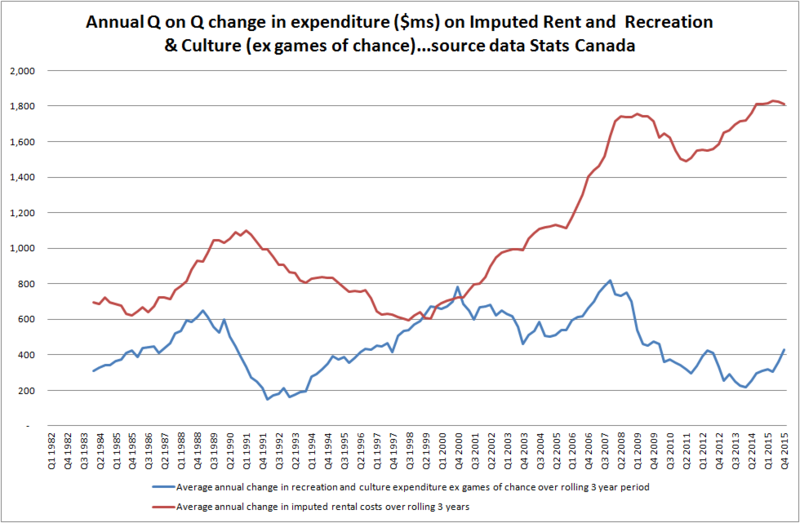 Well, I do not know more than the anecdote, but a couple of weeks ago, as we stopped off at a Starbucks on the way up north, I overheard a barista saying he was offered 5k a month to help flip properties. 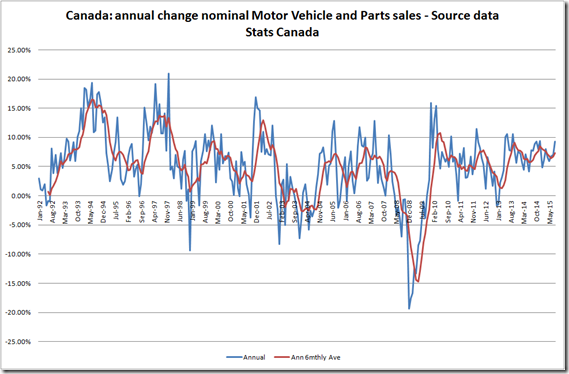 No disrespect, but there might be something going on! 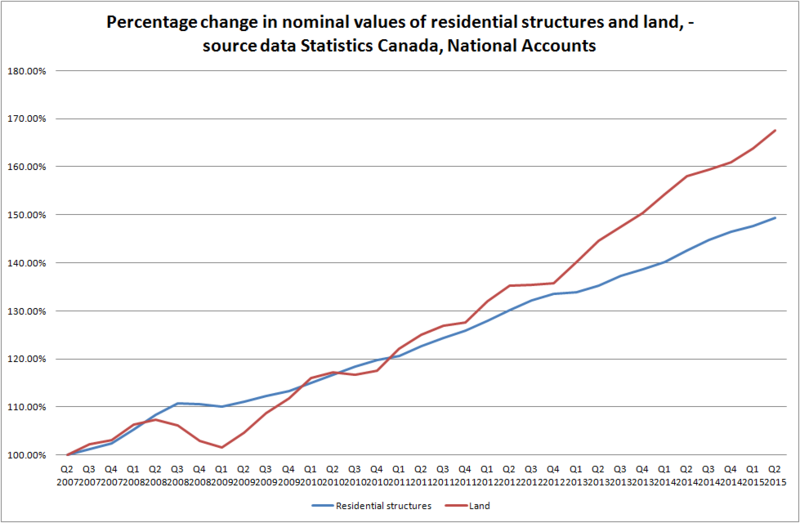 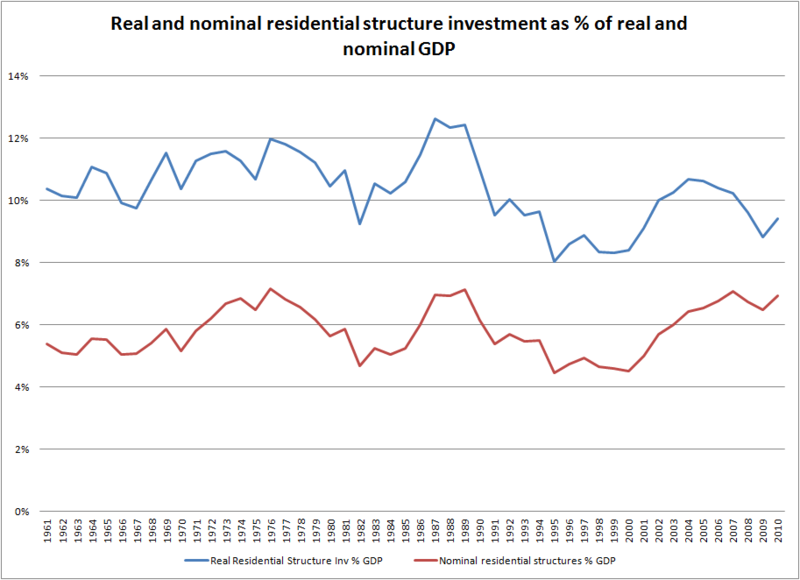 As of Q1 2012, residential construction represented some 48% of nominal GDP growth, and including non residential structures, some 66%. 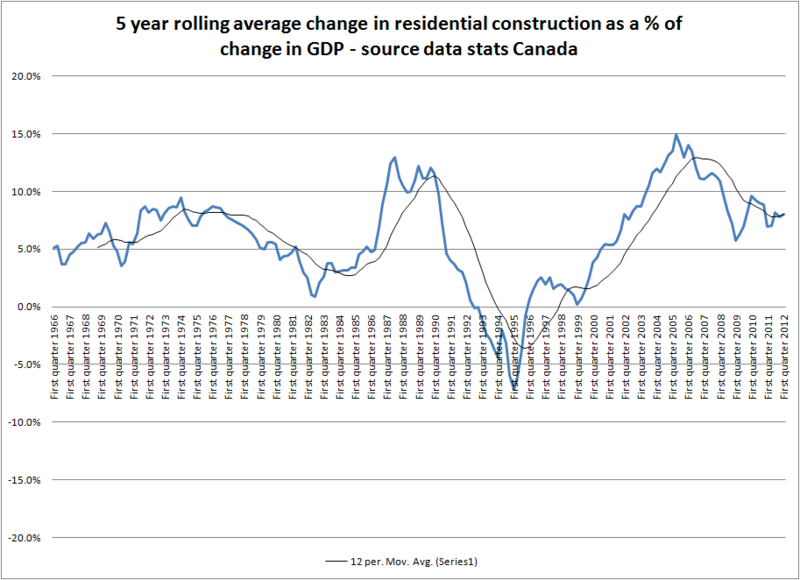 I do not know about “you”, but driving round Toronto is all about spot the crane! 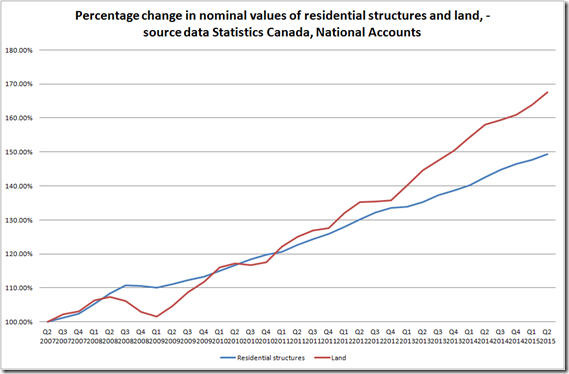 Really, have you ever seen so many cranes? 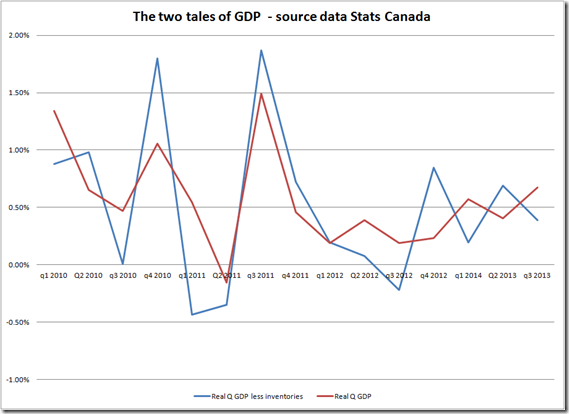 Canada Q3 GDP – weak domestic economy bar residential investment and exports..
Real GDP increased by 0.9% in the third quarter, or an annualised 3.8%. 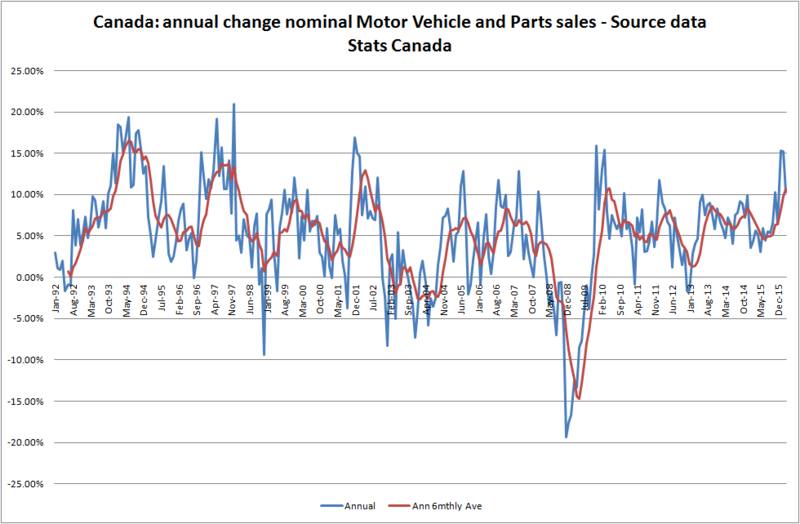 At first glance this would appear to be a healthy clip. 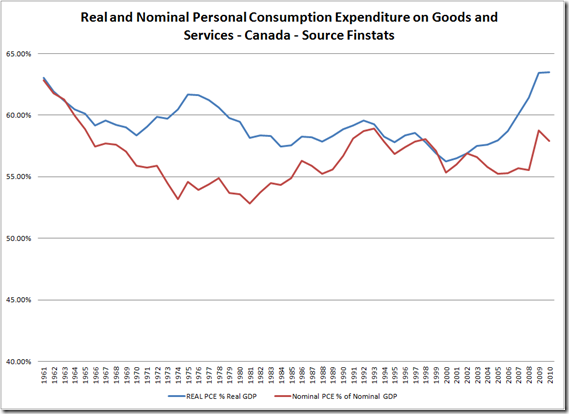 Real personal consumption expenditure weakened, contributing just 21.6% of the increase in real GDP in comparison to its weight in real GDP of 63.2%. 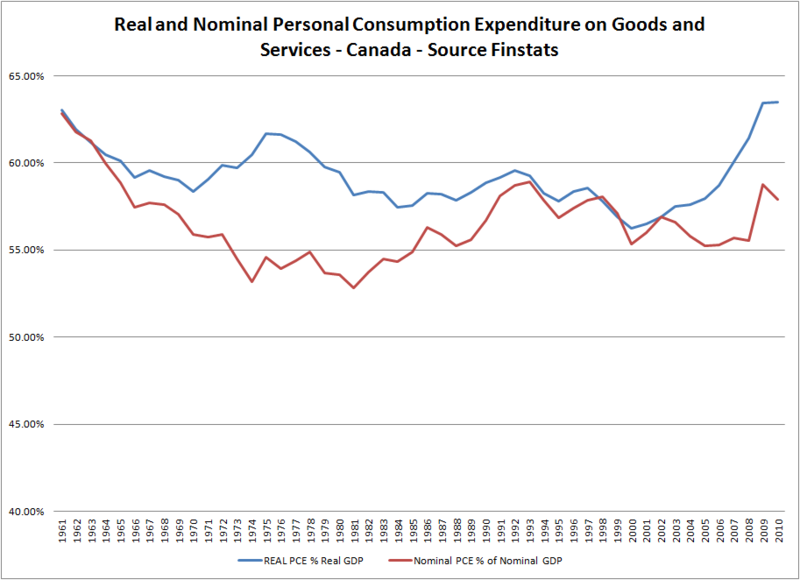 Nominal personal expenditure comprised 30% of the increase in GDP and compared to a weight of 57%: why the difference between the two – real GDP measures changes in volume and suggests that the volume of GDP consumed by personal expenditure has increased more over the years due to the price deflator being less for this component of GDP – note that the Canadian dollar fell significantly from 2003 onwards. 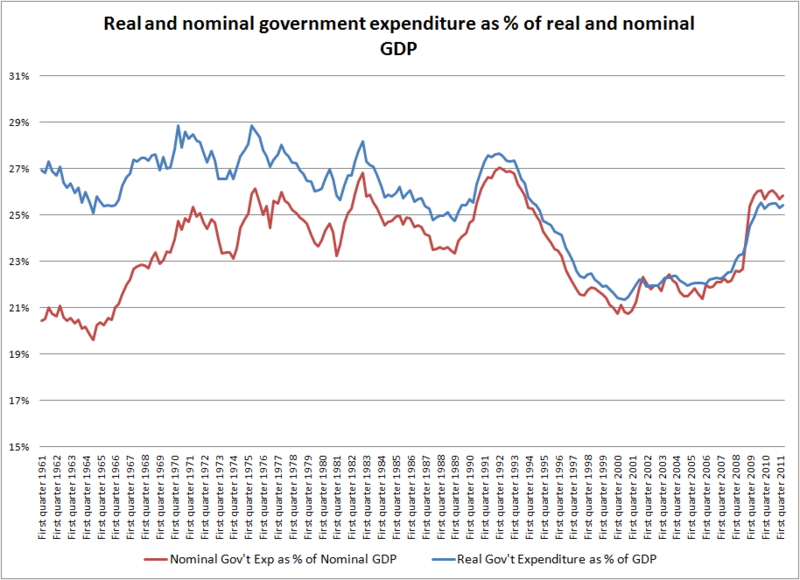 Real government expenditure (including its contribution to gross fixed capital investment, but excluding inventories) contributed negatively to real growth in the quarter but positively to nominal GDP (12%) – government expenditure as a % of real and nominal GDP is some 25%. 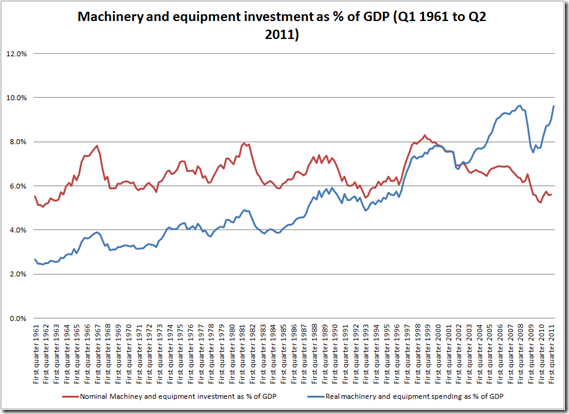 Real business investment in non residential structures and equipment fell by 15%, as a % of the increase in real GDP, well below its component share of GDP of 20%: real investment in machinery and equipment fell 32%. 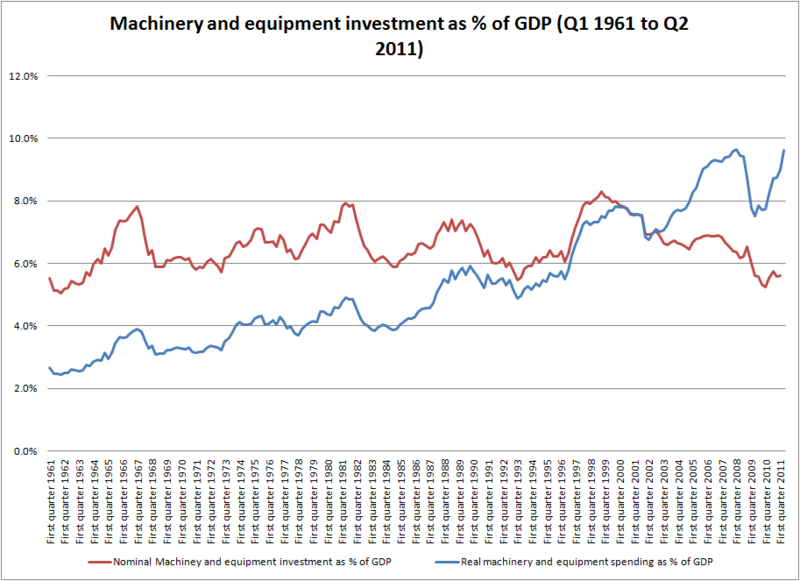 Nominal figures contributed 4% to nominal GDP relative to a 12% component share, with investment in nominal machinery and equipment falling by 8% of the increase in GDP. 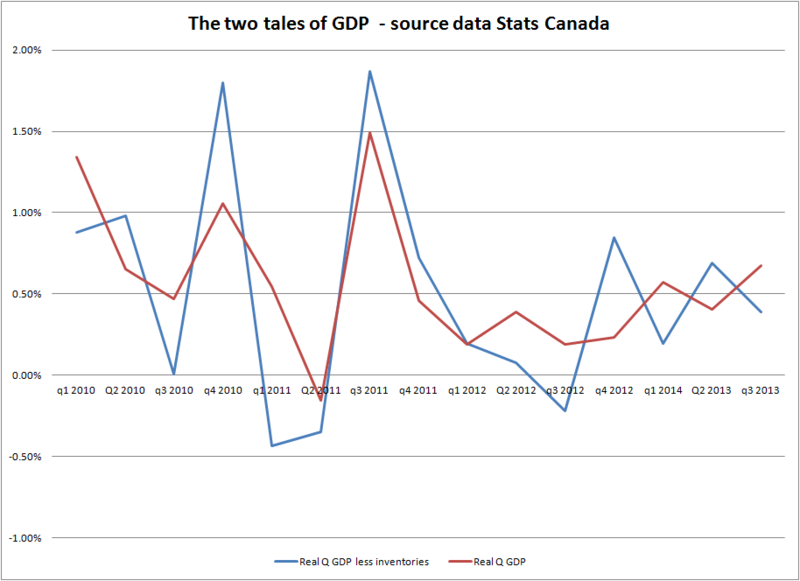 Again the higher volume component of the real GDP figures looks to be due to the appreciation in the loonie reducing the cost of imports and capital goods. 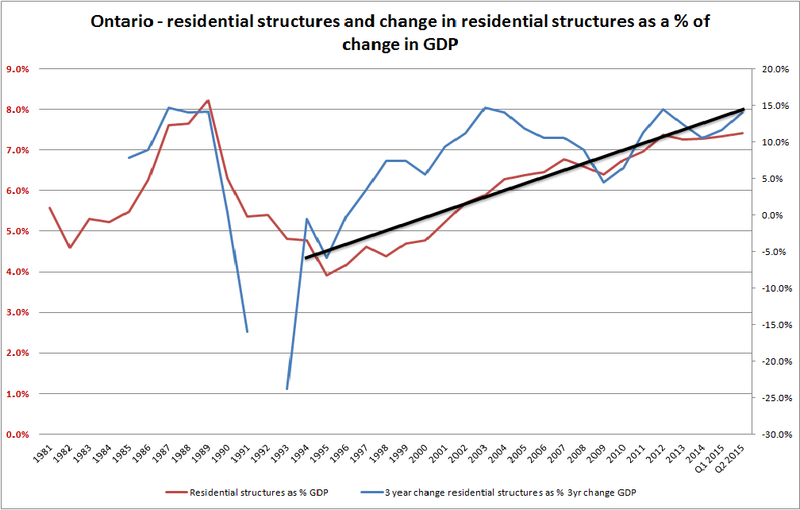 Real investment in residential structures rose by 18.2% of the increase in GDP, well above its share of GDP of 6.04%. 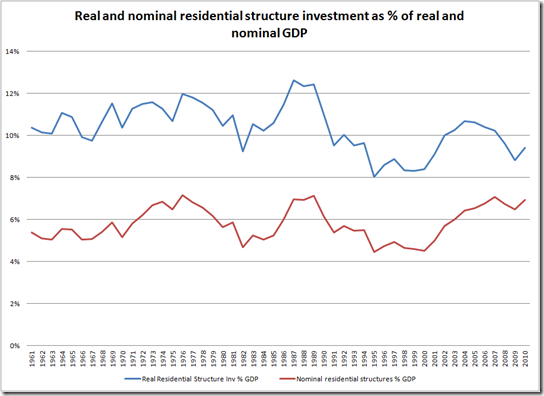 Nominal investment in this category represented 7% of GDP and rose during the quarter by 19% of the increase in GDP. 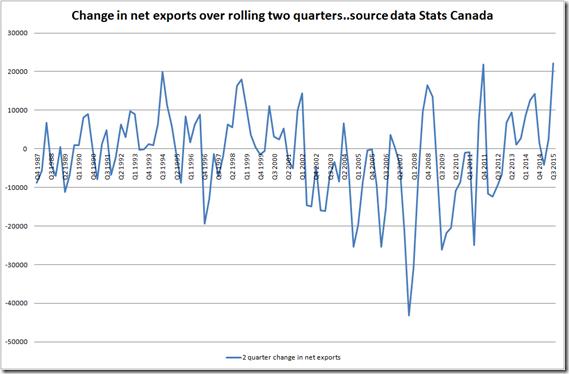 The major contribution to real growth was a rise in exports and a decline in imports, equivalent to 134% of the change in real GDP over the month. 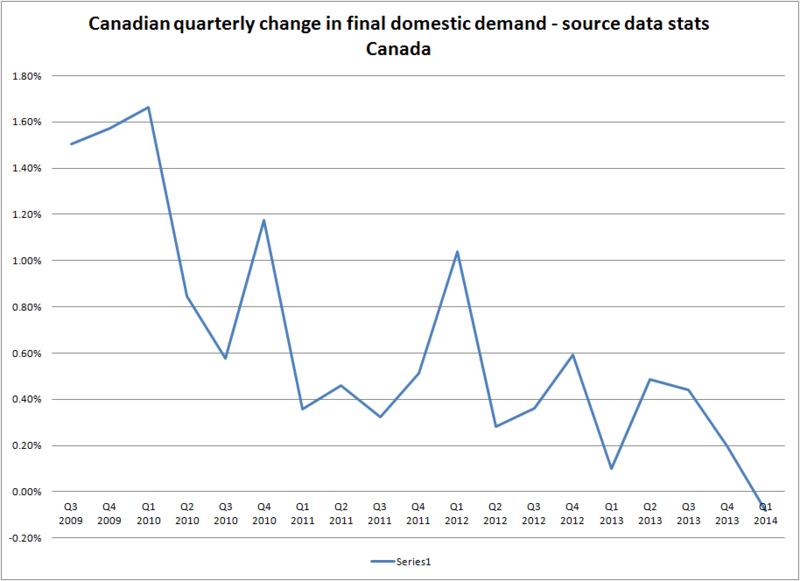 Final demand rose by 0.2% excluding the impact of exports. 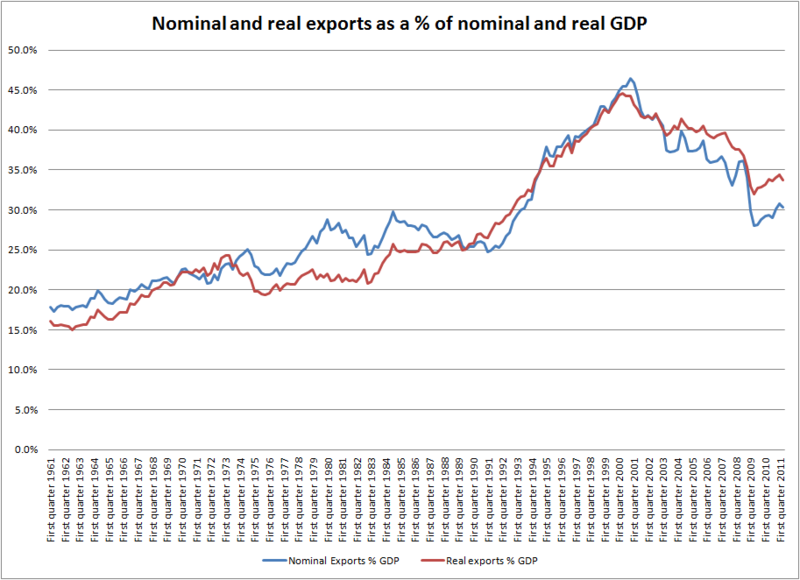 In terms of nominal GDP, the net increase in exports was some 91% of nominal GDP. 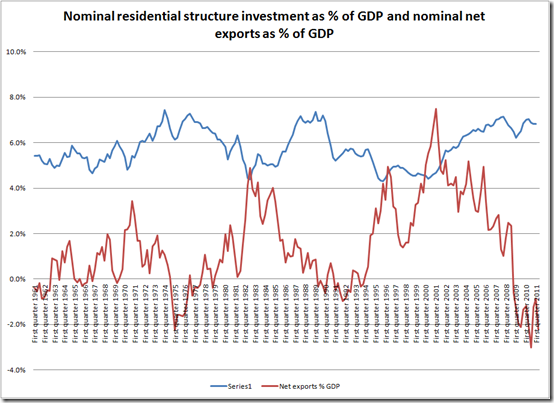 The quarterly increase in the contribution of net real exports was the third largest post war increase. 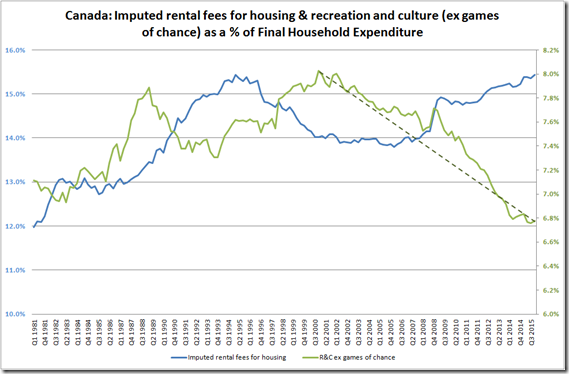 This is significant. 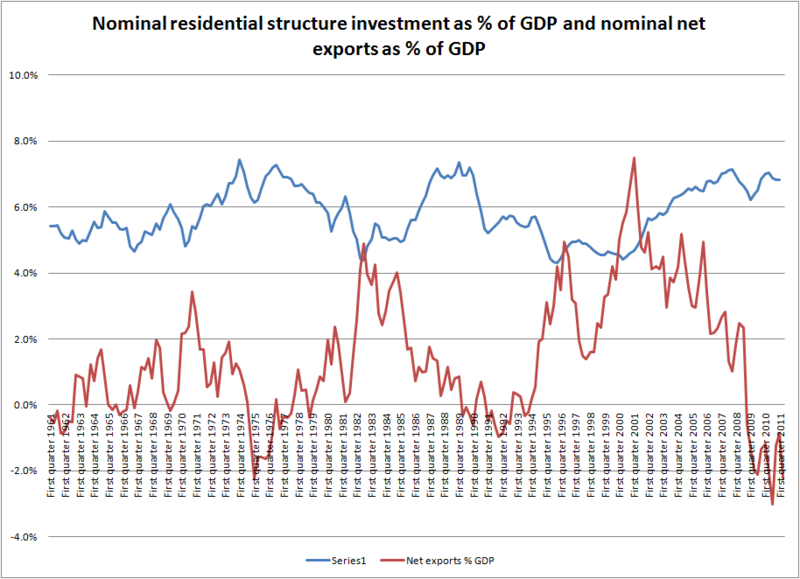 Also of potential significance is the apparent relationship between nominal residential structure investment and nominal net exports as a % of GDP. 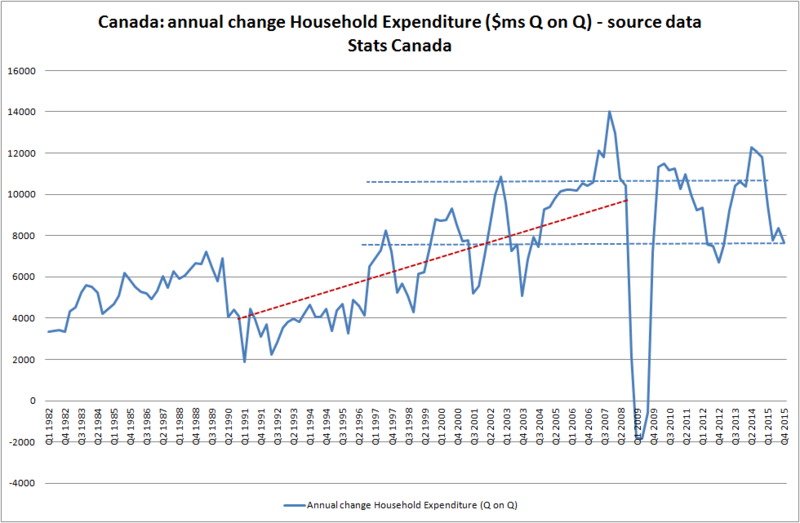 Overall, underlying domestic economic growth is weak and dependent on global demand just as a) the consumer seems to be reining in expenditure, amidst high debt levels, and b) as government deficit reduction measures bite into final demand. 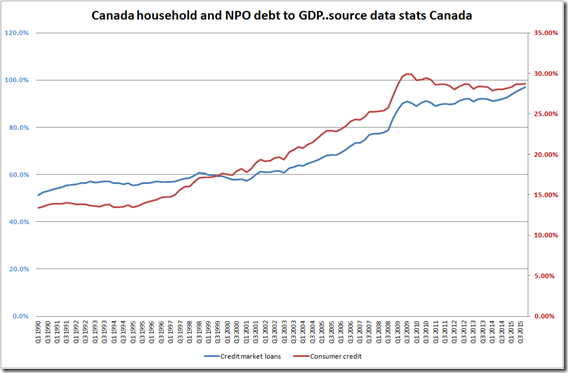 Canada is exposed to weakness in global growth and high levels of debt.